The TL;DR? As long as you've got the boats chained together, you can take away the guide channel for a section of the ride, and the boats will continue to follow one another through that section. Heck, you could even move the chain of "boats" onto a land segment for a bit. 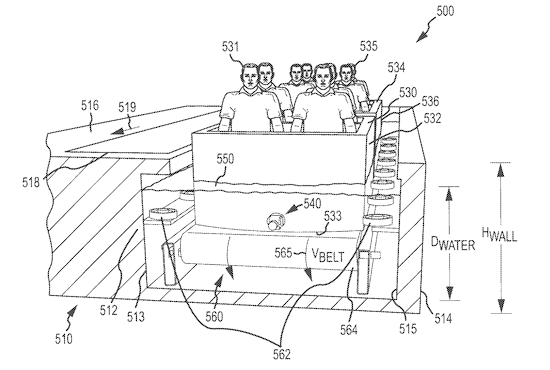 So where will we see this new type of omnimover boat ride? The consensus on Twitter seemed to be Shanghai Disneyland. But once a company proves a technology in one park, it's nice to get a return on that tech development expense by spreading the technology to other parks. 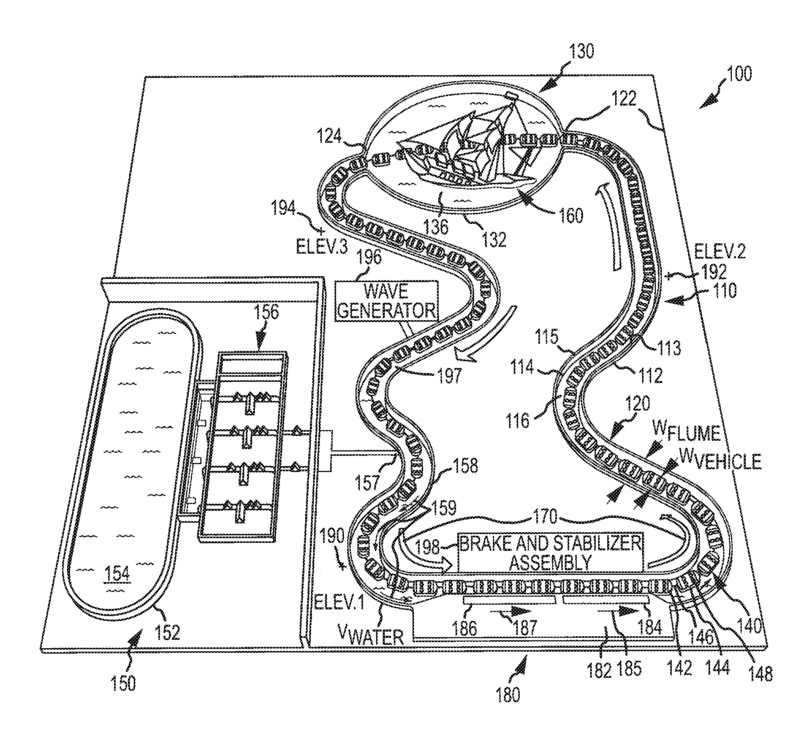 Of course, if Disney gets this patent, that would block other theme park companies from developing similar rides, so US theme park fans would need to wait for Disney to decide to bring it over here. February 20, 2013 at 1:53 PM · Disney has a lot of peoplemovers..... this one floats. February 20, 2013 at 2:42 PM · Can you really patent "attach your boats together with a chain"? Well, maybe nobody thought you could before. And the new patent law takes effect, I think next month, that says the first person to file a patent in the winner, rather than the first person to actually invent something. So if nobody has already patented this, and the patent office doesn't decide this is so obvious as to be unpatentable, the new law might actually help. BTW, I'd expect to see a lot of patent filings over the next month or so, as there may be many things that other have created that they didn't patent, and that patent-jumpers can now claim. February 20, 2013 at 2:44 PM · Too bad they didn't have this figured out in time for Voyage of The Little Mermaid...can you IMAGINE? February 20, 2013 at 3:05 PM · Is it possible that we can see this used as a part of Avatar at Animal Kingdom, or has construction on that project been set back? February 20, 2013 at 3:13 PM · I'm interested in how Disney will deal with buckling, i.e., when the first car is attempting to reenter the guide rails, the first car turns sharply in one direction while the adjacent car turns sharply in the other direction. February 20, 2013 at 3:39 PM · Seems ok. Not the newest and greatest tech, but still cool. However, when they mention "waves", i wonder at the extent of their usage. Do they mean small waves to lap at the side of the boat? or do they mean rolling tides that allow bay sections of the ride to rise and fall enough to create a little thrill? If the later, this could be really incredible! February 20, 2013 at 3:41 PM · I forgot to log in. The comment regarding the extent of the waves is mine (though it probably isn't up yet). February 21, 2013 at 6:34 AM · Wow another people mover like the haunted mansion or small world. Those rides were made like 40 or 50 years ago right? It's going to be in water too unbelievable. First you tell me they are coming out with a family coaster seven dwarfs and now a small world ride in water. Truly what can the imagineers think of next........ I know how about an interactive que..... It's a great time to be a Disney Fan. February 21, 2013 at 6:39 AM · Not only the boats will go forward as the omnimover but also the boats will move from side to side in the same way the doombuggies do (I saw another patent for that in one site, I don’t remember which). That is definitely Shanghai Pirates. The lake part will be a show similar to the one in DHS, and the boats (or at least the upper part of the boats) will turn to the center of the stage while continue to navigate sideways, and the guide channel part will be similar to the traditional pirates attraction. February 21, 2013 at 9:40 AM · Am I the only one that's excited about this? As a lover of the classic darkride concept, I bemoan the fact that there aren't MORE new rides installed yearly that seek to emulate the Haunted Mansion and Pirates of the Caribbean. I get the irony that they've submitted a patent for a ride design that looks 40 years old, but the latest thing in technology doesn't always mean "better." Sometimes it does. "Spider-man" and "Harry Potter" certainly broke some new ground, but I still feel the classic darkride concept is a perfectly viable vehicle for interactive storytelling. February 21, 2013 at 9:54 AM · I guess with those vague descriptions and the branding of an "omnimover" you guys are quick to dismiss the potential. I think the system, from what I hear at work, will not necessarily be an omnimover in the sense that vehicles are close to each other at all times. True, they move in a loop, but the space between the boast will be wider than one expects. The most notable aspects are the ability to have the boats float from point A to B in a wider pool of water without guide rails, and in addition, waves and currants to affect and change the course of the boats in the pool. February 21, 2013 at 9:57 AM · The first thought was Avatar boat ride as its layout matches the Avatar proposal. A chained boat is the worst way to enjoy a boat ride. What would have gotten me excited is a kuka robotic arm that holds a boat and takes the boat on a journey with simulated jumps and spins. I give you this idea for free. February 21, 2013 at 4:59 PM · WHAT ABOUT THE DROP? You can't have a drop on an omnimover. I guess going down a waterfall at 2 miles an hour might be thrilling from the effect of possibly falling out. February 23, 2013 at 7:05 PM · With the introduction of new attractions like SeaWorld Orlando's Antarctica and Hong Kong Disney's Mystic Manor utalizing the free roam ride system, I am surprised Disney is entertaining this antiquated idea. An unending chain of boats does not sound appealing to me. At least other rides utilizing the omni mover technology do a decent job distracting riders from the fact that the next ride vehicle is so close, but a chain of boats encourages my least favorite part of boat rides, the inevitable "log jam".